The 250-acre New York Botanical Garden is the largest in any city in the United States. It has 50 speciality gardens that house over one million plants. There is a sustainable rose garden; a native plant garden that shows off North America's diversity of plants; and trees that are over 200 years old. There is even an authentic, Victorian-style greenhouse. It's easy to spend a beautiful, warm day meandering around the gardens, even getting lost. The garden offers a range of activities for visitors of all ages from a children's adventure garden to fine dining establishments for adults. There are gardening classes, art exhibits, lectures, tours, live music, even parties. With so much to do it can be overwhelming. Here is your guide to maximizing your day in one of America's best gardens. When distinguished Columbia University botanist Nathaniel Lord Britton and his wife, Elizabeth, visited the Royal Botanic Gardens near London, they fell in love with the idea of a natural oasis in the heart of a city. They determined that their home, New York City, should have one of the best gardens in the world. New York Botanical Garden was established in 1891. Over the next century the garden grew and grew, collecting incredible plant species from all over the world. A research library was established to hold the information about the plants. The garden built the second largest research herbarium in the world (It has over 7.8 million plant specimens!) 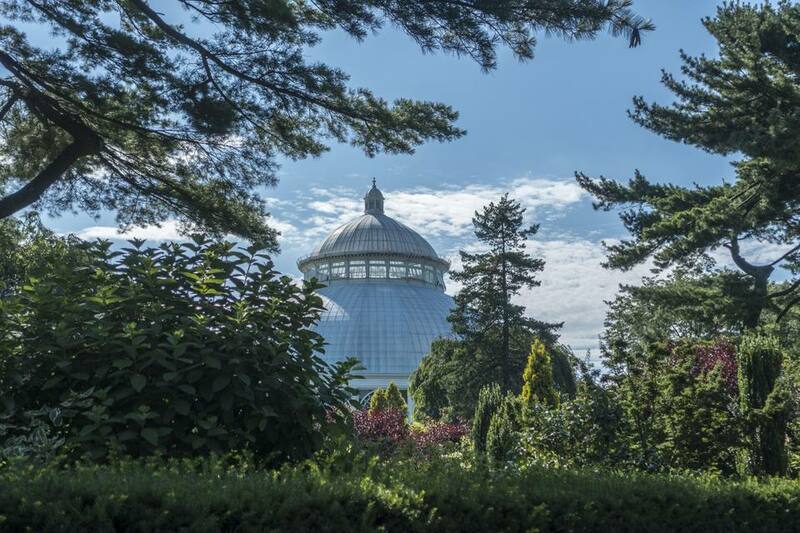 A victorian-style glasshouse became not just a home to tropical species like cactus and palms but a New York City historical landmark. Now millions of visitors take advantage of all the resources of the garden every year. It's a beloved institutions by scientists, tourists, and locals alike. The New York Botanical Garden is located at 2900 Southern Blvd., Bronx, NY 10458. The Bronx is the northernmost borough in New York City. The easiest way to reach the garden is by public transportation. It's located just a 20-minute train ride from Manhattan's Grand Central Terminal. Take the Metro-North Harlem line to Botanical Garden Station, and there are signs pointing you to the nearby garden entrance. You can also reach the gardens by subway, although the journey is slightly longer. Take the B, D, or 4 train to Bedford Park Station and then get on the Bx26 bus east to the garden's entrance. If you want to drive there is ample parking. The all-garden pass includes current garden exhibitions, the conservatory, the rock garden and native plant garden, the tram tour, garden grounds, and the art gallery. On weekends it costs $28 for adults, $25 for seniors and students, $12 for children 2-12, and children under 2 are free. You can save money by visiting on a weekday. Prices Monday through Friday are $23 for adults, $20 for seniors and students, $10 for children 2-12, children under 2 free. There are also discounted ticket prices for New York residents; make sure to bring proof of residency. The Garden is open year-round Tuesday to Sunday. Hours are 10 a.m. to 6 p.m. although those are subject to change for special events. While the gardens are typically closed on Monday they are open for Martin Luther King, Jr. Day, Presidents' Day, Earth Day, Memorial Day, Labor Day, Columbus Day, and Mondays in December when the Holiday Train Show is running. While there are things to see all year round, one of the best times to visit is spring. The weather is warm but not too hot, and the garden is waking up from winter. If you head there from March to May you are likely to see more than the 200 cherry trees in blossom. In December, the garden is decorated for the holidays and you can see the world famous train show. The New York Botanical Garden spans 250 acres, so it can be difficult to decide where to go. A good way to start is by determining what is currently bloom now. On the website there is a regularly updated list of what is flowering and where to go during your visit. There is also a navigator where you can look up the location of plants by name. A few minutes of research can save you a lot of time and energy. Then there are some must-see highlights. The Peggy Rockefeller Rose Garden has more than 650 varieties of roses. They are in bloom from May to October, making this an ideal time to visit. The greenhouse is a must see. Because it's climate controlled you can see lush tropical rainforest plants year round. In early summer and fall the greenhouse shows off water lilies. The azalea garden boasts pink, white, coral, and purple blossoms that come alive seasonally. If you have children with you don't miss the children's adventure garden. This is a 12-acre heaven for the little ones. There are climbing platforms specially designed for them to see all the plants below them as well as a maze. The space regularly hosts hands-on activities and experiments. See the full schedule here. A tram takes visitors from place to place if you don't feel like walking. The New York Botanical Garden is known for its programming for visitors of all ages. Every few months it puts on a special exhibit and then has evenings themed to it. For example when the garden showed Georgia O'Keeffe's paintings of Hawaii (and planted what was portrayed in them in the greenhouse) it held Hawaiian nights with special food, dance, and music. The garden also holds a series of lectures and classes for children and adults. You can search for what you're looking for on the website in the "What's On" section. One of the biggest holiday events of the year in New York City is the Train Show. The garden builds model trains that journey through hundreds of New York landmarks all made from plants. The set is spectacular, and many locals flock there to see it every year. There are a range of places to eat and drink during your visit to the New York Botanical Garden. Pine Tree Cafe is a casual cafe where you can pick up pizza, salads, sandwiches, and sweets and then eat them under unusual pine trees, some almost 100 feet tall. The Hudson Garden Grill is a farm-to-table restaurant that uses all local ingredients to make salads, sandwiches, entrees, and deserts. The space is made from reclaimed wood from trees that fell during Hurricane Sandy. There is bar service from 3 to 6 p.m. It's a little fancier so probably not the best place for kids. The garden is vast, and you might be doing a lot of walking. Plan your attire accordingly. Also remember that you will be outside. Selfie Sticks, Pets, and tripods are not allowed. Strollers are allowed everywhere except the Conservatory, Discovery Center, Ross Hall, and Art Gallery. There is strolling checking in these locations. It is important to conserve the grounds so walking on the grass, picking flowers, or touching any plant or tree is strictly forbidden.